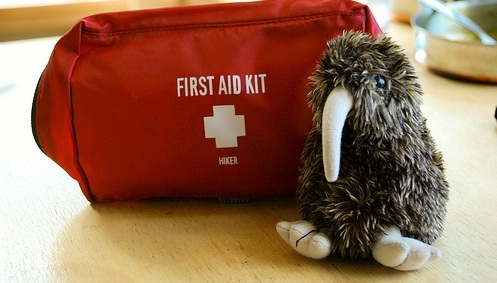 Sometimes the injury is minor and only requires simple first aid measures. Accidents invariably happen, regardless of how prepared you are or how careful you try to be. Here is a basic guide on treating your baby’s boo-boos, large and small. The first thing you do for an injured child in case of an accident is called first aid. In case of severe injuries resulting from accidents, first aid ensures that the victim is given the basic treatment to avoid loss of blood, airway obstruction, death, etc. before the advanced treatment providers arrive. Sometimes the injury is minor and only requires simple measures that can be provided with first aid. Accidents invariably happen, regardless of how prepared you are or how careful you try to be. Here is a basic guide on treating your baby’s boo-boos, large and small. Unfortunately, there is no amount of safety prevention that can prevent minor cuts and scrapes. When babies are learning to walk and run, they are unsteady on their feet and often clumsy. This means that cuts and scrapes happen. Luckily for you, most of these are minor and can be treated at home. Wash your hands with antibacterial soap and warm water. Use lukewarm water to cleanse away any blood and dirt that is on the wound surface and cleanse the cut with antibacterial soap and water. Gently pat the area dry with a clean gauze pad. Apply pressure if the cut is bleeding for about 5 minutes. Apply antibacterial ointment (Bacitracin or Neosporin) and then cover the wound with a bandage. Keep the area covered and change the bandage daily. The cut is ragged, deep, or longer than an inch. The cut is embedded with gravel or dirt. The cut is caused by a sharp object, rusty object, or animal or human bite. Heavy bleeding continues after direct pressure is applied. Whether it is a hot iron or a cup of coffee, these types of accidents are common in children. Curious crawlers are more prone to these types of injuries. According to experts the only type of burns that should be treated at home are first-degree burns that affects only the outer layer of skin. Run cool water (not icy water) over the area for around 5 to 10 minutes to lower the skin temperature. Apply a thin layer of aloe vera cream or gel to ease the pain. Cover the area with a damp gauze. The burn has blistering areas on it. This indicates that it is a second-degree burn that affects the outer and underlying layers of skin. The burn covers a large area. The burn is on the face, hands, feet, or genital regions. Mosquitoes, bees, spiders, and other insects will often bite you and your baby. Most bites and stings are harmless, but some can cause allergic reactions, infections, and serious pain. Apply a cool compress or rub with an ice cube to ease itching. Use Calamine lotion or a baking soda paste to alleviate itching. Cut down or file your child’s fingernails so that scratching don’t result in infection. Use an over-the-counter topical antihistamine to relieve itching. Use an over-the-counter topical steroid (hydrocortisone 1%) to decrease swelling. The insect bite or sting appears large, becomes painful, or looks infected. The insect bite or sting causes other symptoms to occur such as fatigue, nausea and vomiting, aching joints, or a rash. This could indicate Lyme disease. Your child has an allergic reaction that can be a potentially life-threatening condition leading to throat swelling, difficult breathing, enlarged lips, wheezing, hives, and other symptoms of anaphylaxis. Keep Kids Healthy, LLC. (1999). First Aid. wat is the best treatment for scars after a burn from hot water? Red Blotches on Stomach and Body - Is this Alcohol Poisoning? Tooth and facial bumps, how I can treat this? Possible 3rd Degree Burn-Healing time? Does varying the incline prevent shin splints? Does color light therapy work for skin conditions such as psoriasis?